The Vice-Admiralty Court Act was one of the hated Townshend Acts which created new taxes on the British American colonies and called for strict enforcement of customs regulations. The Vice-Admiralty Court Act gave Royal naval courts jurisdiction over all matters concerning customs violations and smuggling, rather than colonial courts. Before the Act, customs violators could be tried in an admiralty court in Halifax, Nova Scotia if royal prosecutors believed they would not get a favorable outcome using a local judge and jury. The Vice-Admiralty Court Act added three new royal admiralty courts in Boston, Philadelphia and Charleston to aid in more effective prosecutions. These courts were run by judges that were appointed by the Crown and who received a 5% award when they found someone guilty. The decisions were made solely by the judge without the use of trials by jury, which was considered to be a fundamental right of British citizens. In addition, the accused person had to travel to the location of the court of jurisdiction at his own expense and if he didn't show up he was automatically considered guilty. This system made it hard for an accused person to get a fair trial. The Vice-Admiralty Court Act was not passed until July 6, 1768, a full year after the other four Townshend Acts. Lord Charles Townshend, the Chancellor of the Exchequer, after whom the Townshend Acts were named, had passed away suddenly in September, 1767. Because of this, some scholars do not include the Vice-Admiralty Court Act with the other Townshend Acts, but most do since it deals with the same issues. The Act was not passed by Parliament, but by the Lords Commissioners of His Majesty's Treasury, with the approval of the King, to aid in prosecutions of smugglers. The Townshend Acts outraged the colonists because they created taxes without their consent since they had no representation in Parliament; they eliminated trial by jury and put Crown-appointed judges in charge of trials, rather than local judges and juries; they created a new regime of commissioners to enforce regulations and prosecutions; and shut down the New York Assembly for failing to comply with the Quartering Act of 1765. The colonists rioted, protested and boycotted English goods to pressure Parliament to repeal the Acts. This led to the eventual occupation of Boston by British troops, which resulted in the Boston Massacre in 1770. Eventually, the Townshend Acts' taxes were repealed, except for the tea tax, which outraged the colonists and caused them to dump a shipload of tea into Boston Harbor, an event now known as the Boston Tea Party. Parliament's response was to close Boston Harbor until the tea was paid for and to take over the government of Massachusetts. The outbreak of the Revolutionary War was not far behind. You can read the text of the Vice-Admiralty Court Act below or learn more about the Townshend Acts here. the 6th day of July 1768. 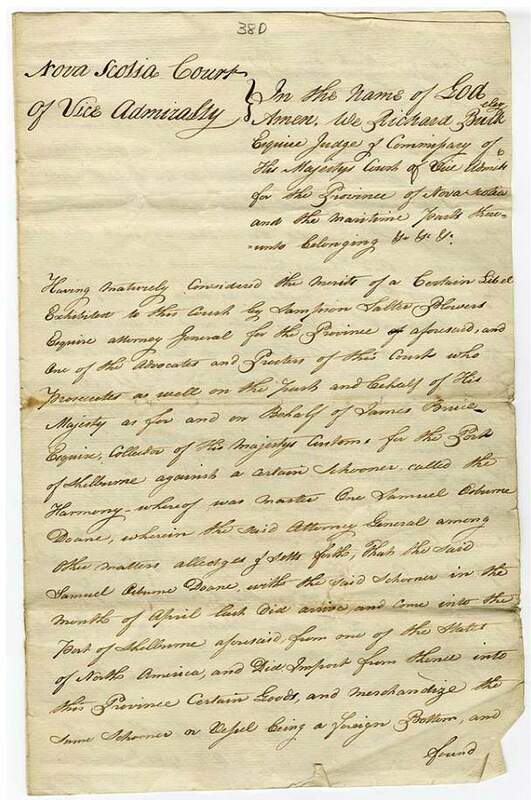 "We the Commissioners of your Majesty's Treasury beg leave humbly to represent to your Majesty, that whereas by an act passed in the last Session of the last Parliament intituled An Act for the more easy and effectual recovery of the Penalty's and Forfeitures inflicted by the Acts of Parliament relating to the Trade or Revenues of the British Colonies and plantations in America. It is enacted that from and after the first day of September 1768. all forfeitures and Penaltys inflicted by any Act or Acts of Parliament relating to the Trade or Revenues of the British Colonies or Plantations in America may be prosecuted sued for and recovered in any Court of Vice Admiralty appointed or to be appointed and which shall have jurisdiction within the Colony Plantation or Place where the cause of such prosecution or suit shall have arisen and that in all cases where any Prosecution or suit shall be commenced and determined for any penalty or forfeiture inflicted by any such Act or Acts of Parliament in any Court of Admiralty in the respective Colony or Plantation where the Offence shall be committed either party who shall think himself aggrieved by such Determination may appeal from such Determination to any Court of Vice Admiralty appointed or to be appointed and which shall have Jurisdiction within such Colony or Plantation or Place—And whereas it will greatly contribute to the due Collection of your Majesty's Revenue and to the prevention and punishment of Frauds committed against the same and will likewise tend to the more speedy and effectual administration of Justice within the said Colonies and Plantations and be agreable to the Intention of the Legislature in passing the said Act that a sufficient number of such Courts of Vice Admiralty be consituted and established at proper and convenient places within the said Colonies and Plantations. We humbly submit to your Majesty whether it may not be expedient and necessary for the purposes above mentioned to revoke the Commission appointing one only Court Vice Admiralty over all America and in lieu thereof to establish four other Courts of Vice Admiralty the first at Halifax in the province of Nova Scotia the second at Boston in the Province of New England the third at Philadelphia in the Colony of Pensylvania and the fourth at Charles Town in the Colony of South Carolina: The said Courts to have Jurisdiction within certain Districts to be allotted to them respectively by your Majesty And We humbly lay before your Majesty the enclosed plan of Districts proper to be allotted to the said Courts which we submit to your Majesty's consideration each of the Judges of the said Courts respectively to be allowed such Salary as your Majesty shall think proper to be paid in the first place out of your Majesty's Moiety of the money arising from any Penalties and Forfeitures to be levied within the said Colonies and Plantations and if this Fund shall not be sufficient out of the money arising from the sale of old Naval Stores and the said Judges to be expressly enjoined in their Commissions upon pain of loosing their Offices not to take any Fee or Gratuity whatsoever for any Judgment given or "business done in their respective Courts." His Majesty taking the same into His Royal Consideration is pleased with the advice of His Privy Council to approve thereof and accordingly to order as it is hereby ordered that a Commission be passed under the Great Seal authorizing the Lords Commissioners of the Admiralty to revoke the Commission appointing one only Court of Vice Admiralty over all America and empowering them in the lieu thereof to establish four other Courts of Vice Admiralty the first at Halifax in the Province of Nova Scotia, the second at Boston in the Province of New England, the third at Philadelphia in the Colony of Pensylvania and the fourth at Charles Town in the Colony of South Carolina as proposed by the aforegoing Representation of the Lords Commissioners of His Majesty's Treasury and the plan of Districts to be allotted to such Courts hereunto annexed—And the Right Honourable the Earl of Hillsborough one of His Majesty's principal Secretarys of State is to cause a Warrant to be prepared for His Majesty's Royal Signature in order to pass such Commission under the Great Seal accordingly.